Peter Vacher is the proud owner of an airworthy Battle of Britain veteran Hurricane – he talked to Ken Ellis about its epic recovery and restoration. Peter’s 1926 Silver Dowry car, built for a Maharaja’s wife, following its painstaking restoration. A WORLD-renowned institution links two elements of Peter Vacher’s life. This is Rolls-Royce, a name synonymous with precision and quality. Peter has taken the step from restoring classic Rolls-Royce cars to acquiring, restoring and now operating a Hawker Hurricane I – powered by a Rolls-Royce Merlin III. After passing his driving test at 17, Peter bought a 1934 Standard Nine for £10 and started to learn about cars by looking after it and repairing it. Restoring motor cars became a hobby for him and he describes the process as “a real passion”. He developed a particular love for Rolls-Royces of the 1920s and 1930s. In 1970 Peter acquired a bare chassis and completed a restorations – he still has that one. Another project was a 1922 Silver Ghost which had previously been in use as a breakdown truck. 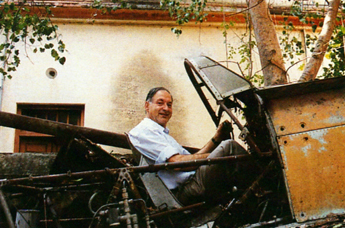 His last restorations was a 1926 Silver Dowry car, built for His Highness the Maharaja of Bharatpur as a gift for this wife. It was exported through Nepal in 1983 in poor state and described – pretty accurately – as “automotive spare parts”. It languished in store in the UK for a while and then Peter came by it. An epic eight-year restoration has resulted in a work of art. A good friend of Peter’s, John Fasal, made many travels in India, seeking out and chronicling Rolls-Royces owned by Maharajas for an impressive book on the subject. Peter joined him in 1982 for a trip from Calcutta to Delhi, taking in princely state by princely state, asking for permission to look into garages, to look, photograph and admire. At Varanasi, the Banaras Hindu University was on their ‘hit list’. It was known that the school had cars for technical instruction. To their delight, they found a Silver Ghost and Phantom I.
Alongside the workshop holding the cars was a walled compound. Just visible above the wall was a cockpit. Inspection found this to be from an intact, but very forlorn-looking Hurricane. At this stage, Peter had no interest in aircraft and thought no more about it. A job in academic publishing took Peter and his wife Polly to Australia in 1993. Down there the two of them learned to fly. They returned to the UK after three years – both committed aviators. 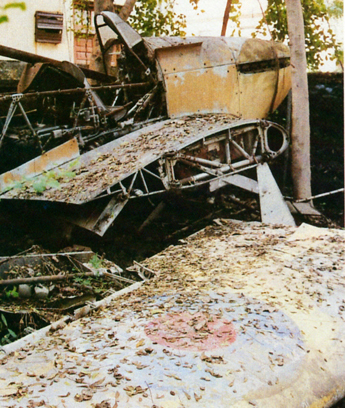 It was then that Rolls-Royce and aircraft fused, and Peter remembered the Hurricane sitting in a yard in India. But I couldn’t possibly still be there could it? John and Peter went back to Varanasi in 1996. It was still there and they made an approach to purchase it. Peter could not have realised it at the time, but “undoubtedly the most difficult part was getting it out of India”. What followed was “a six year saga of negotiations” and no less than ten visits to India. Peter related a delightful story about a lighter moment in the grinding and pendulous process to acquire the Hurricane. He was becoming frustrated at never ending levers of bureaucracy that unfolded with seeming ease time after time. Well miffed with another turn and twist in the process, Peter threw his hands in the air and bemoaned Indian officialdom. A sage-like voice came from the other side of the desk with a question: “And who taught us bureaucracy?” Well, the ‘Brits’ of course. Touché. Then, out of the blue, in 2001 came a “yes you can have it but it must go before the students come back”. Great, thought Peter. Then he was told that would be the following week! The removal from the compound is a story in its own right and you must turn to Peter’s book Hurricane R4118 for details of what became a part comedic, part tragic, wholly traumatic experience. During this the Times of India started a campaign to have the export halted, although this particular airframe held practically no significance to the national heritage, whereas the university certainly stood to benefit from the new equipment the sale would allow. No less than ten visits to India were required before R4118 could come home. Peter Vacher dreaming of the days when that cockpit would come back to life. During his many visits, Peter was getting to know more and more of the history of the Hurricane. 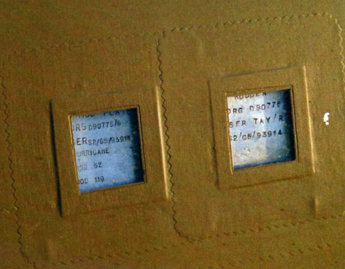 The serial number had been found and research showed it was a genuine Battle of Britain veteran. Once R4118 was back in the UK, Peter realised that uncovering every aspect of the aircraft’s past was by far and away “the best part” of the whole project. It had flow 49 sorties during the Battle of Britain, had been involved in five shoot-downs and at that time, five of its pilots were still alive. Peter started where most historians do when compiling the ‘biography’ of an aircraft, with the Form 78, what the RAF calls the Aircraft Movement Card – which charts the units or ‘keepers’, accidents, modifications and repairs. From the Form 78 the search for information, snippets and lead spread out like tentacles in all directions. With obvious delight, Peter showed me through just one element of the incredible research he has undertaken and which forms the basis of this book. The talked me though what he had learned from the study of just one element of his Hurricane: “the wings are so interesting”, Peter announced with glee. One of several accidents that befell R4118, necessitated the entire wing being replaced. Inspection of data plates on the wings tells a story. One plate carried LMSD/DDF/41H/xxxxx. Deciphering this took some time and as a consequence Peter became aware of the workings of an incredible operation – the Civilian Repair Organisation. CRO was a network of workshops and sub-contractors beavering away on parts, sub-assemblies or whole aircraft, getting them back into action as soon as possible. So what did the plate reveal? Hawker part numbers all have ‘41H’ as a prefix. The ‘CCF’ bit was Canadian Car and Foundry of Fort William, Canada. And ‘LMSD’? – London Midland and Scottish at Derby; the railway works rebuilt Hurricane wings for the CRO. 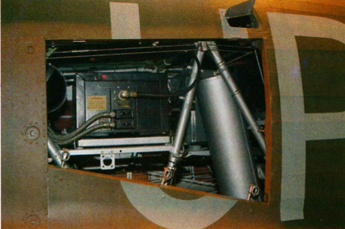 So R4118 was fitted with Canadian-built wings for one of its repairs. But those wings had themselves been damaged, requiring repair at Derby. 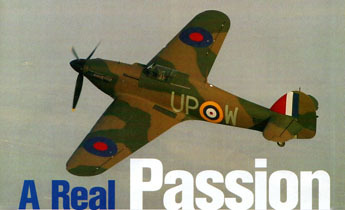 Across the whole airframe a series of part numbers have brought about blues to work carried out including PA – Parnall Aircraft of Yate, Glos and RAD – Rollasons of Croydon, Surrey. Two others, Peter has yet to ‘crack’ – ‘AF’ and ‘S2’ – can you help? Gloster built R4118 in the summer of 1940. ‘G5’ and ‘G8’ appear in many places. ‘G5’ was Hawker’s code for the airfield at Hucclecote, where R4118 first flew and ‘G8’ the massive factory at nearby Brockworth where it was produced. So what does a plate marked ‘DRLM G5 9201’ tell us? Well, we know the ‘G5’ bit. ‘DRLM’ is CRO member, David Rosenfield Ltd, Manchester. This company carried out repair work prior to the aircraft’s despatch to India in 1943. 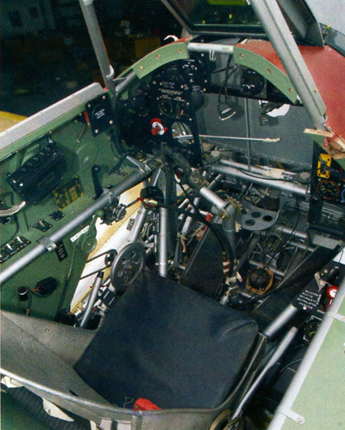 The cockpit during the final phase of restoration at the HRL workshop. With the Hurricane safely in the UK, Peter embarked upon a four-pronged project. He had selected Tony Ditheridge’s Hawker Restorations as the aircraft restoration contactor –HRL having a long and admirable track record. Peter would act as the central liaison throughout. Likewise Peter would do the same with the engine restorations. This was placed with Maurice Hammond, well-known North American P-51D Mustang pilot and restorer, and a wizard with Merlins. Peter also set to the sourcing of parts, tracing suppliers, setting up exchanges for the bits needed and trying to keep a pace on the whole complex process. Finally, he was researching every element of R4118’s history and tracking down surviving pilots. From very early on, he had a book in mind – laying down the incredible provenance of this aircraft was “a vital element of getting the restorations right”. Peter summed up all this activity: “I’ve had to keep a lot of balls in the air”. 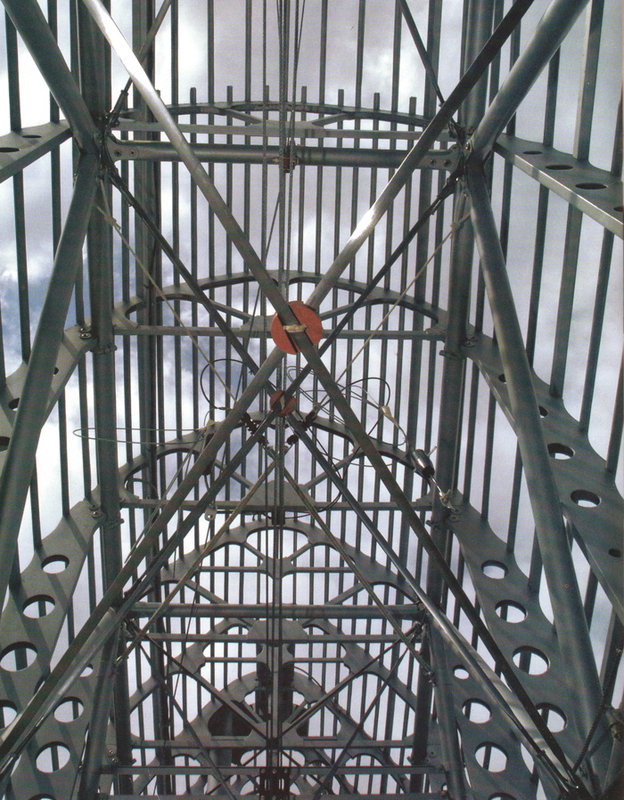 Superb view from inside the fuselage looking up through the ‘birdcage’ of ribs. “Where I have been particularly pedantic.” Explained Peter, is to get the restoration “back to its Battle of Britain days”. Bearing in mind that the wings were not those it was born with, this desire has had to be checked with what is possible and/or practical. “The history of this airframe can’t be ignored, the changes it has been through have helped it to survive,” he said. Another example of these changes through its service life if that this MkI had MkII undercarriage legs, and the Tailwheel is post-1940. The control column spade grip, during the restoration phase. Such major items could be replaced but this would make the project more complex, more costly and infinitely longer. Where its Battle of Britain status could be powerfully re-instated would be in all the period fittings throughout the airframe, what Peter calls “all the trinkets”. 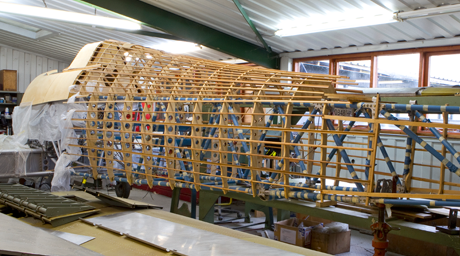 This is where Peter’s standards shine out, the vast majority of this work will remain largely unseen – being buried deep in the fuselage and wings. A great example of a ‘trinket’ is the TR.1133 radio, the RAF’s first VHF set. R4118 would have had one of these, but they are very rare – Peter knew of only two existing, and the museums involved were not going to give them up. This was John Elvins who knew of a collector near Bath who had one. Over a period of time, he was persuaded to release the radio and John got it working. The TR.1133’s tuning is too crude for modern-day radio transmission, it blasts our on far too wide a band, So, although Peter had a working and wholly accurate radio in his Hurricane, he can’t actually use it – that’s determination to see perfection! The decision was taken to preserve the original 12-volt electrical system. This was not done lightly, because it means that R4118 needs a ground power unit to start it. It also meant 12-volt bulbs for the undercarriage indicator! Peter was beginning to despair of ever finding such things. Then he was introduced to a US-based Internet search site – ‘Parts Base’. A stock turned up in Auckland, New Zealand. 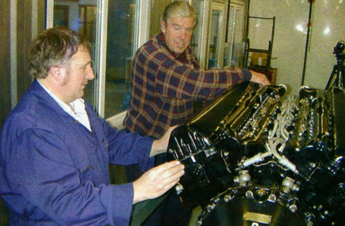 HRL’s Tony Ditheridge introduced Peter to Maurice Hammond, who was to rebuild the Merlin. Maurice was more than happy to help Peter dismantle the engine, piece by piece, so that he could learn all about it –it’s a beloved Rolls-Royce after all. The methodical strip-down took three months; the engine restorations itself occupied 15 months. R4118 was fitted with a Merlin III, effectively the first production version of the classic engine. Like most other things about this MkI Merlin IIIs are also thin on the ground. Without the help of Dr Michael Fopp and the RAF Museum, R4118 would not be in the air. 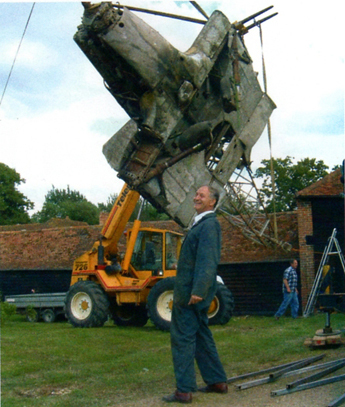 The Museum lent a MkIII to become the basis of the flying engine – a superb and far-sighted gesture. Maurice’s approach to the Merlin restoration was “absolutely meticulous” – every bearing being measured to a tenth of a thou. The pilots who have flown the Hurricane say that it is the smoothest-running Merlin they’ve known. One modern improvement has been made to the engine, the installation of ‘Merlin Fingers’. 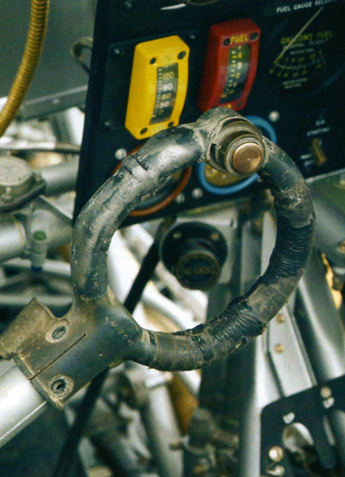 Where the cams rotate on the rockers, originally there was a chrome-plated pad. In time this chrome would break up, causing a sharp edge and wear to the engine. A Canadian company developed a system post-war of machining away the pad and putting a solid lump of tungsten in its place. These are ‘Merlin Fingers’. Maurice now makes these ‘fingers’ and they are very effective. 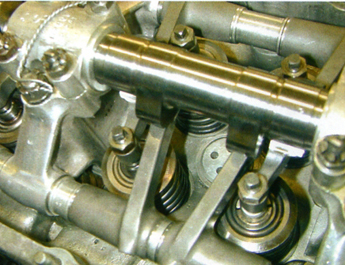 An inspection in early March showed the parts to be immaculate. 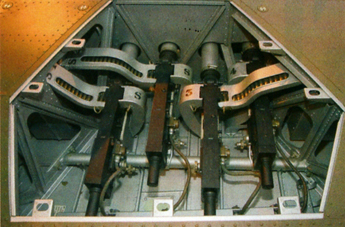 Skycraft was responsible for the propeller hub and blades. Parts for the complex hub came from a wide range of sources. 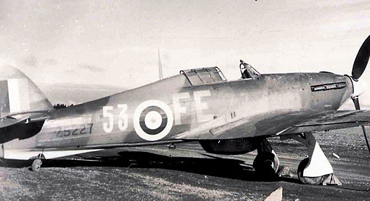 When Peter acquired the Hurricane, he got a Rolls-Royce Griffon engine at the same time. This was a Mk66 as fitted to a Spitfire XIX and Peter exchanged this with The Fighter Collection in return for a good hub. But more parts were needed, and the Ulster Aviation Society over at Langford Lodge in Northern Ireland pitched in with the example it held. In return it wanted a static replacement to go on its Merlin. Additionally, Peter Wood – being another Rolls-Royce aficionado – was of great help on the project in a variety of ways, especially with regard to the engine. Peter Vacher finds it incredibly ironic that after all of R4118’s exploits during the Battle of Britain, the reborn aircraft had no choice but to have Hoffman blades fitted. The best Germany can offer! The choice of HRL as the airframe restorer was not a hard one. The pages of FlyPast have charted the flow of immaculate Hurricanes that have come from the Suffolk workshop. Peter describes HRL as “excellent…they finished to the price they quoted and in virtually the time they said”. As the airframe came together, with the engine and the propeller assembly coming along more or less in parallel, time came to apply the colour scheme. Bill Bishop, a QANTAS captain, spent a couple of years researching the colour scheme and had done a superb job. R4118 would fly in the colours it wore in August 1940 with 605 (County of Warwick) Squadron based at Drem, to the east of Edinburgh. 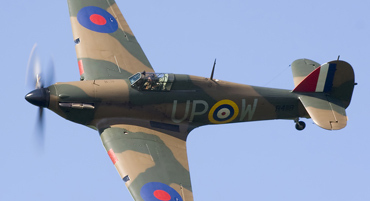 The codes were ‘UP-W’ – hence the Hurricane’s civil registration – G-HUPW. Clive Denney and the Vintage Fabrics team applied the fabric and painted Papa-Whiskey to meet Bill Bishop’s researches. In the search for the venue for the test flights, Marshall of Cambridge “shone through” with an offer of the use of hangar space at Cambridge Airport…”and have been superb”. Pete Kynsey took the Hurricane on its first flight on December 23 last year, and test flying up to the granting of a Permit to Fly has been smooth. Thanks to Marshall, R4118 will be based at Cambridge for the remainder of the 2005 ‘season’. Peter’s wife Polly is a famed long distance solo flyer in her distinctive Piper Dakota light aircraft. Polly has been training in Florida, step by step with Tailwheel types, ending with a North American R-6 Texan, so that she can fly the Hurricane in due course. Polly’s record-breaking flights were sponsored by Shell and this goodwill has transferred to the Hurricane. The company will sponsor the fuel and oil for 2005. It is hoped that son Julian, currently flying Boeing 747s, will also pilot the family Hurricane. And will Peter get to fly the aircraft he knows inside-out, year-by-year? ‘No’ is the answer. He said that “you have to be quick and out-think such a powerful aircraft.” He’s perfectly content knowing what an achievement it has all been and gets immeasurable satisfaction watching it fly. Peter’s real passion for Rolls-Royce has taken wings.